Kinesiology (Touch for Health) is a powerful, natural healing method which is based on the study of the musculature and energy meridians of the body. Anatomy and muscle testing will be covered as well as techniques to bring the body into balance and to increase strength. Using muscle tesing TFH shows where stress is locked into the circuits of the body. It identifies and balances these areas using techniques from acupressure, Chinese energy theory and Neurolymphatic massage. Heightened body awareness and specific movements will develop the mind-body dynamic to achieve increased memory, sharper logic and to accomplish personal goals readily. 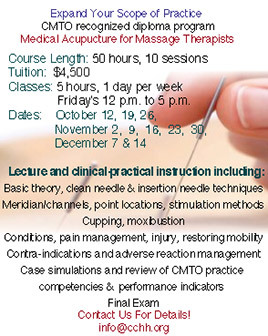 This course is divided into 4 parts, each comprising of 16 hours of instruction - 64 hours.